Offering one- and two-bedroom apartments from 515 to 700 square feet, City Park is just a couple of miles northwest of the historic Temple Square. And within a mile’s travel are 6 restaurants, including the fabulous Red Iguana (I recommend any of their mole dishes), as well as both traditional and Mexican grocery stores, six schools, and eight parks. Less than a mile to the temple, Marmalade Hill has four floor plan options for 1- and 2-bedroom apartments from 750 to 900 square feet. Less than a mile from Energy Solutions Arena and the Gateway Shopping Center, you’d be within walking distance of sporting events, concerts, water fountain shows, and the best shopping in the valley. And again, eight beautiful parks — one right across the street! The closest apartments on our list, Park Capitol is just half a mile from the temple, so it’s an easy 5-minute walk to the beautiful site. Ranging from 420 square feet to 1,260 square feet, Park Capitol offers seven floor plans in studio, 1-, and 2-bedroom apartments. There’s even a penthouse! On a hill, these apartments also offer a great view of the valley and the Wasatch Mountains, and it’s far enough away from the hustle-and-bustle of the city, you may not notice you’re so close to everything! 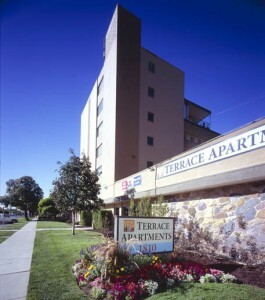 A little farther from the busyness of downtown, and boasting a “garden apartment community,” The Terrace is about three miles from the LDS temple. There are studio, one-, and two-bedroom apartments ranging from 310 square feet to 764 square feet, and huge 2,030-square foot 3-bedroom penthouse apartments, as well! The Terrace is about two miles from the eclectic Sugarhouse area, and the same distance from the fun and fancy Gateway Shopping Center. Plus, it’s less than a mile to watch the Bees play baseball in the Spring Mobile Ballpark! So if you’re looking for a downtown rental, Salt Lake City has great choices near the temple – and everything else! Good luck picking the right one for you!